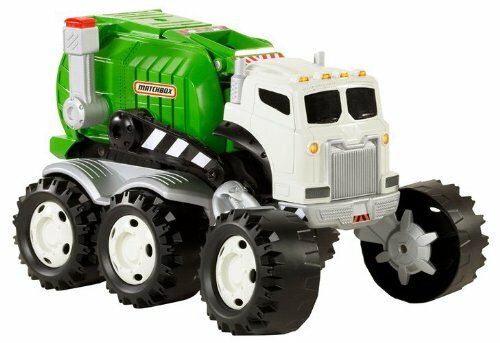 Mattel offers an additional big rig on the scene with the Matchbox Stinky the Garbage Truck. Recommended for ages 3 years and up, this truck makes the best gift for small children who love playing in the dirt. 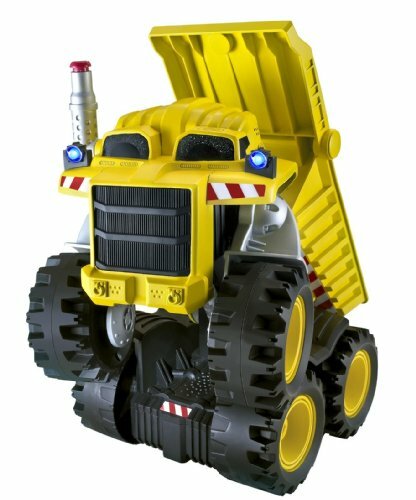 Weighing 5 and a half pounds with dimensions of 13.5 x 9 x 13.5 inches, the interactive dump trucks talks, moves, and does more than your average toy dump truck. Included in the box with Stinky are four C batteries, the Big Rig Buddies DVD and instructions. Matchbox has an entire line of Big Rigs, including Rocky the Robot Truck and Smokey the Fire Truck. This new big vehicle, Stinky the Garbage Truck, has a fun personality and sense of humor. No wonder it has been one of the most popular toys on Amazon for little boys. The truck is programmed with over 90 words and sounds to keep your kids completely occupied. Stinky enjoys socializing with your children just as much as they like talking to him. He can tell Credit: http://www.amazon.com/Matchbox-Stinky-The-Garbage-Truck/dp/B00383LP8M/ref=sr_1_1?ie=UTF8&qid=1327128081&sr=8-1 your children jokes, exercise with them, and even sing to them. He can likewise have a serious side, and talk about the business of dumping with those playing with him. He also has those same mechanisms as a real garbage truck, throwing out small items that can be inserted through his “mouth” grill. He can make certain that you know when he’s hungry so you can feed him your own small Matchbox and Hotwheels cars! If the children want some slack from having fun with Stinky, they are able sit in front of the TV and enjoy the DVD that accompanies the garbage truck. The dvd showcases a young boy and the complete Big Rig crew engaging in activities that exhibit camaraderie, cooperation, and other important characteristics to its viewing audience. While left inactive for a while, Stinky the Garbage Truck will fall sound asleep, and a press of his smoke stack will be required to wake him up. Pushing it repeatedly will cause him to raise up and dance around to just one of the many melodies he can play. Credit: http://www.amazon.com/Matchbox-Stinky-The-Garbage-Truck/dp/B00383LP8M/ref=sr_1_1?ie=UTF8&qid=1327128081&sr=8-1Should You Purchase the Matchbox Stinky the Garbage Truck for Your Young Child? Stinky the Garbage Truck from Mattel can be bought for around $45 at Amazon, Toys R Us, and other toy stores. The many features of the garbage truck help make him worth it to most parents. On Amazon, the nearly 80 reviews average four stars so the toy is a good value. While Stinky may not necessarily be a learning toy, it encourages creative play for young boys and provides interation during play. The ideal age is 3 years and up for Stinky the Garbage Truck, so it is a perfect inclusion to a toddler’s wishlist, especially those who enjoy having fun with toy vehicles. Stinky takes 4 “C” Batteries, but they are included with the toy so there’s no further cost to get this toy ready to go the second he comes out of the box! I know a lot of dads who wish toys this cool were around when they were kids.